The Sacred Cauldron is a community center where people can learn about Wicca and find healing and peace. We first opened the Sacred Cauldron in 2007 in Dorval on Herron Road. It expanded from one room into a classroom, store and dojo. At the end of 2018 the Sacred Cauldron officially moved to Summerstown, Ontario (1 hour from Montreal and 1 hour from Ottawa). Teachers from the Greenwood Celtic Shamanic Wiccan Tradition that live in Montreal continue to lead Covens and teach classes at different locations. Through our network we also promote activities in Cornwall, Toronto, Vermont, Joliette and other locations in Quebec. If you are interested in finding out more or if there is a location for classes near where you live please send us an email. Le Chaudron Sacré est un centre communautaire où les gens peuvent en apprendre davantage sur la Wicca et trouver la guérison et la paix. Nous avons ouvert le Chaudron Sacré pour la première fois en 2007 à Dorval, sur Herron Road. Il s'est étendu d'une pièce à une salle de classe, un magasin et un dojo. À l'été 2016, le Chaudron Sacré s'est installé à Pointe-Claire. À la fin de 2018, le Chaudron Sacré s'est officiellement déplacé à Summerstown, en Ontario. Les enseignants de la tradition wilcanienne chamanique celtique de Greenwood, qui vivent à Montréal, continuent à diriger Covens et à donner des cours dans différents endroits. Grâce à notre réseau, nous faisons également la promotion d’activités à Cornwall, à Lancaster, à Toronto, au Vermont, à Joliette et dans d’autres villes du Québec. Si vous souhaitez en savoir plus ou s'il existe un lieu de cours près de chez vous, envoyez-nous un courrier électronique. Meri is the founder of the Wiccan Sacred Circle network, the Sacred Cauldron Center and the Greenwood Celtic Shamanic Wiccan Tradition. Click here to read more about this Tradition. She is an Elder and Initiated as a 3rd degree High Priestess by Lady Rhiannon of the Coven of High Oaks, American Welsh Tradition, has a black belt in Ninjutsu and a Bachelor of science in Nursing. She studied Shamanism with the Foundation for Shamanic Studies for 14 years and is also a Celtic Shamanic Practitioner. Although retired from a 30 year nursing career, specializing in Oncology and Palliative care, Meri continues her commitment to compassion by offering spiritual end of life accompaniment incorporating her years of nursing experience and her expertise as a Shamanic practitioner. A Celtic Wisdom Sanctuary features the writing of Meri Fowler. Please become a patron for $1 a month and support the work! Click here for the link! 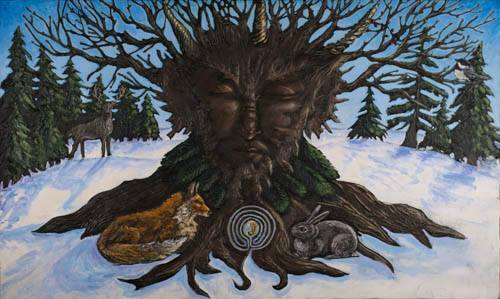 Hawk Oberon is a 3rd degree Initiate of the Greenwood Celtic Shamanic Wiccan Tradition and the acting Chief or High Priest of the Tradition. He has been studying the Occult and practicing Wicca and Shamanism for more than 25 years. He is a natural healer as well as a teacher of Wiccan Therapeutic Touch, a unique form of TT that he developed with Meri. He also has a 3rd Dan in Ninjutsu. Hawk Oberon is a guiding light in our community and brings peace and laughter wherever he goes. He co-teaches a Coven with Meri and is an inspiration to us all. If you would like a healing consultation with Hawk please contact us. Hawk Oberon est un initié au 3ème degré de la tradition wiccan celtique Shamanique de Greenwood et le Chef ou le Grand Prêtre de la tradition. Il étudie la Wicca et le Shamanisme occultes et pratiquantes depuis 25 ans. Il est un guérisseur naturel ainsi qu'un professeur de Wiccan Therapeutic Touch, une forme unique de TT qui a été développée avec Meri. Il a également un 3ème Dan à Ninjutsu. Hawk Oberon est une lumière directrice dans notre communauté et apporte la paix et le rire partout où il va. Il co-enseigne un Coven avec Meri et est une source d'inspiration pour nous tous. Pour un consultation avec Hawk contact nous! ​Bernie Meehan (Bran) is a 2nd degree Initiate in the Greenwood Celtic Shamanic Wiccan Tradition. He is an experienced Long Distance Backpacker who has hiked end to end the Long Trail in Vermont and is also an Industrial Mechanic. He is the co-founder of the Sacred Cauldron Center and is dedicated to healthy living, and bringing random smiles every day to the people he meets. 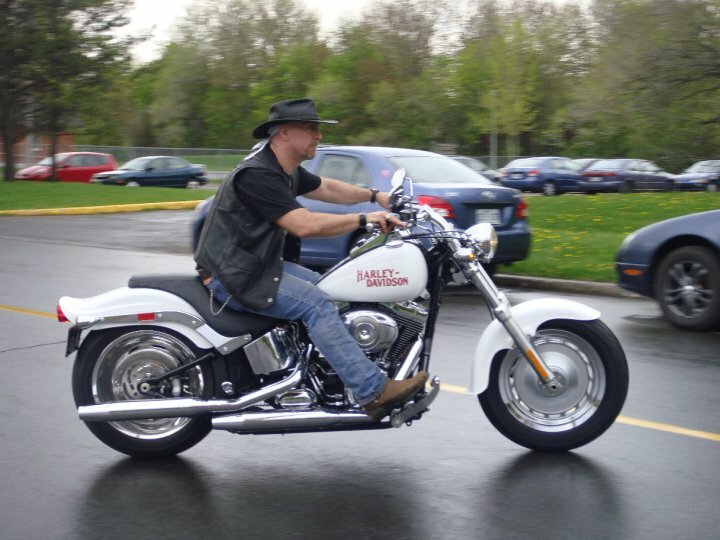 In his spare time he loves to ride his beautiful white 2009 Custom Soft-tail Harley Davidson motorcycle. He is a long-time friend of Bill W.
Bernie Meehan (Bran) est un 2e degré Initié dans la Tradition Wiccan Celte Chamanique Greenwood. El est un randonneur de longue distance qui a parcouru la « Long Trail » au Vermont d’un bout à l’autre et est également un mécanicien industriel. Il est le co-fondateur du Centre Chaudron Sacré et se consacre à une vie saine, et apportant des sourires aléatoires chaque jour pour les personnes qu'il rencontre. Dans son temps libre, il aime monter son beau Harley Davidson 2009 Soft-Tail. Il est un ami de longue date de Bill W.
Pele is a 3rd degree Priestess in the Greenwood Celtic Shamanic Wiccan Tradition. She leads the Women's Circle with Phoenix and is an accomplished healer and intuitive. Pele is available for tarot readings and Shamanic healings by appointment. Pelé est une prêtresse de troisième degré dans la tradition wiccane chamanique celtique de Greenwood. Elle dirige le Women's Circle avec Phoenix et est une guérisseuse accomplie et intuitive. Pelé est disponible pour des lectures de tarot et des guérisons chamaniques sur rendez-vous. Serafina is a gifted Shaman, a Healer and Third Degree High Priestess in the Greenwood Celtic Shamanic Wiccan Tradition. She leads Celtic Moon Coven, teaches workshops and runs our bi-annual Meet the Healers Day. Her open heart and friendly smile welcomes everyone who comes to us. Serafina is available for Shamanic Healing, readings and spiritual counselling by appointment. To send her a message or to make an appointment please click here. Serafina est un chaman doué, un Guérisseur et Third Degree High Priestess dans la tradition celtique Greenwood chamanique. Elle dirige Celtic Lune Coven, enseigne des ateliers et est le gestionnaire du Sacré Cauldron Center. Son cœur ouvert et sourire amical bienvenue à tous qui vient à nous. Serafina est disponible pour la guérison chamanique, des lectures et des conseils spirituels sur rendez-vous. Sophia is a quester of wisdom, a lover of ancient Mysteries and a third degree High Priestess in the Greenwood Celtic Shamanic Wiccan Tradition. She mentors and teaches at the Sacred Cauldron and leads the Daughters of Cernunnos Coven. She loves to garden with exuberance, talk to trees and animals (hoping they listen), and traipse through nature with joy and a reverent heart. She grew up dreaming in fairy tales and myths, studied (mostly) Anthropology, traveled by backpack and inspiration through Celtic and Germanic lands, and settled down to nurture two beautiful children and live the dream of an artist and artisan. Sophia est un chercheur de la sagesse, un amoureux des mystères anciens et une Haute Prêtresse du troisième degré dans la Tradition Wicca Shamanique Celtique de Greenwood. Elle mentore et enseigne au Sacred Cauldron. Elle aime faire du jardin avec exubérance, parler aux arbres et aux animaux (en espérant qu'ils écoutent), et trainer à travers la nature avec joie et un cœur respectueux. Elle a grandi en rêvant dans les contes de fées et les mythes, a étudié (surtout) l'anthropologie, a voyagé par sac à dos et à l'inspiration à travers les terres celtes et germaniques, et s'est installé pour nourrir deux beaux enfants et vivre le rêve d'un artiste et artisan. Oshun is a 3rd degree High Priestess of the Greenwood Celtic Shamanic Tradition and is also the Maiden (assistant) in the Celtic Moon Coven. Born in Western Africa, Oshun spent the first seventeen years of her life immersed in earth-based rituals and religions. As a child, she was known to be most often found at the ocean, or in the forest that surrounded her home, curled up with a book on tales of the Fae. Today, she is a trained Shaman and Healer known for her warm welcoming energy, her compassion and her unconditional willingness to help those in need. Her most serene moments remain those in which she finds herself communing with the Oceans and Lakes, or with the Sprites hidden deep within the forest. Oshun est une grande prêtresse du troisième degré de la Tradition Wicca Shamanique Celtique de Greenwood. Né en Afrique de l'Ouest, Oshun a passé les dix-sept premières années de sa vie immergées dans des rituels et des religions terrestres. Enfant, on le savait le plus souvent à l'océan, ou dans la forêt qui entourait sa maison, recouvert d'un livre sur les contes du fae. Aujourd'hui, elle est un Shaman et guérisseur qualifié connu pour son énergie chaleureuse et accueillante, sa compassion et sa volonté inconditionnelle d'aider ceux qui en ont besoin. Ses moments les plus sereins restent ceux dans lesquels elle se retrouve en commun avec les Océans et les lacs, ou avec les Sprites cachés au fond de la forêt. Heydi Blanco is both a Shamanic and Systemic Family Constellations practitioner who has a private healing practice in Montreal. Born in Nicaragua, Central America she comes from a long lineage of Curanderos (Healers). She is fluent in English, Spanish and French. Her Shamanic path officially began in 2012 with the workshop given by the Foundation for Shamanic studies "The way of the Shaman" and now her services include but are not limited to Shamanic Divination, Extraction, Soul Retrieval, and Compassionate Depossession . All healing sessions are individual as she is always open to what Spirit needs to present. She is also an active member of two drumming circles within the Shamanic community of Montreal. As a Family Systemic facilitator Heydi was trained by the New England Center for Systemic Constellations, located in Branford Connecticut USA founded by Dr. J. Edward Lynch and Bill Mannle. Heydi is now offering open workshops on selected Saturday mornings called “Coffee & Constellations” . For more information click here . All are welcome to come and experience a morning of self discovery by elevating awareness through the method of Family Constellations. This program uses effective exercises to develop self-image, power and beauty by opening up the longing in the heart to achieve endless possibilities. For more information or to book a consultation please email Heydi at heydi@hiess.ca or call (514) 931-1512 Blessed be. R.A. Priddle is a special collection librarian and historian of magic, religion, and science from Williamstown Ontario. He earned his Masters of Arts in Religious Studies from the University of Ottawa and his Masters of Information from the University of Toronto concurrently in 2013. Robert has traveled Europe and North America studying and speaking about magic and is delighted to return home to the region to share his experience and expertise in the ubiquitous but little understood technology of magic. R.A. Priddle est un bibliothécaire spécialisé dans les collections et historien de la magie, de la religion et des sciences de Williamstown, en Ontario. Il a obtenu sa maîtrise ès arts en études religieuses de l'Université d'Ottawa et sa maitrise en information de l'Université de Toronto simultanément en 2013. Robert a voyagé en Europe et en Amérique du Nord pour étudier et parler de la magie et est ravi de rentrer chez lui dans la région. partager son expérience et son expertise dans la technologie de la magie omniprésente mais peu comprise.